Ahead of VivaTech, 50 tech CEOs came to Paris to have lunch with French President Emmanuel Macron. Then, they all worked together on “tech for good”. The event was all about leveraging tech around three topics — education, labor and diversity. 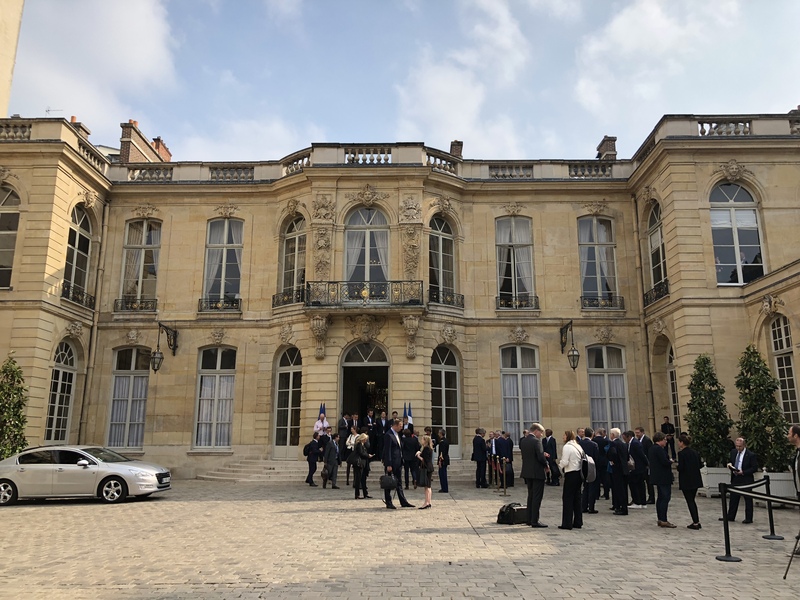 At the end of the day, French Prime Minister Édouard Philippe invited everyone for a speech in Matignon. It wasn’t a groundbreaking speech as Macron is also speaking at VivaTech tomorrow morning. “We’re trying to pivot France,” Philippe said. Maurice Lévy, the former CEO of Publicis, one of the two companies behind VivaTech with Les Échos, first introduced the event, as well as Eric Hazan from McKinsey. McKinsey worked on the data that was used to start those discussions. So let’s see what they talked about. He then listed a few important points to make sure that nobody is going to be left behind, such as coaching and mentorship programs. “This is not just the government’s job but it is also the job of private companies,” Khosrowshahi added. He wanted to remain hopeful and it felt a bit like a lobbying effort. “It’s easy to see the lost of jobs because of automation. But it’s much more difficult to dream about the possibilities of the future,” he said. In other words, don’t worry about the on-demand economy, don’t worry about self-driving cars. IBM CEO Ginni Rometty was in charge of the discussions around education. “We also had a lot of engineers and pragmatic people there. And we ended up with five recommendations,” she said. Focus and segment this problem. Focus on the quarter of the population the most at risk. Align the skills that businesses need with the education system (hard skills and soft skills). There should be an open partnership with governments to reposition vocational education, learn by doing, foster internships, apprenticeships, simulations and redirect tax to incentivize. Work with teachers to pilot, get hard evidence and then scale. Retraining employees is the responsibility of all employers. Finally, SAP CEO Bill McDermott talked about diversity. “As we looked at the facts, there are 33 percent more revenue, more profit for companies that got the memo on companies more inclusive and more diverse,” he said. Culture, gender and geography were the main themes. But they also talked about differently able people. SAP will make an announcement around autism in France. “Dara, Ginni and Bill, thank you for your introduction, that was brilliant, in English and concise,” French Prime Minister Édouard Philippe said. He then listed three ideas that sum up his thinking about the tech industry. “I truly believe in freedom, in that fundamental ability that you need to be able to take good decisions and bad decisions,” he said. The second idea is the consequence of that first one. “While you don’t have to regulate on everything, when something isn’t regulated, it’s possible that it gets out of your control. And when it comes to the digital revolution and the data revolution, that freedom needs some boundaries. You know that Europe worked on some regulation — GDPR. What looked like regulation against innovation now appears as desirable and useful,” he said. The fact that 50 CEOs came to Paris is interesting by itself. It’s a sign that tech companies want to have an open discussion with governments. They want to make sure that regulation is favorable. On the other end, governments want to make sure that tech innovations aren’t going to divide society. Some companies announced a few things in Paris. Uber expanded its accident insurance to contractors across Europe, when they’re working and also when they’re not on the road. IBM plans to hire 1,800 people in France. Deliveroo is going to invest $117 million (€100 million) over the next few years. Let’s see if Macron has more to say tomorrow.